"I had saved for years to be able to afford it. We were never happy with our prior enclosure purchased from a competitor, it did not slide well on the tracks, it lifted several times during wind storms and landed partially in the pool. Until one day it just completely blew away....as in some pieces went as far away as an 1/2 mile. Granted we live in the country and it had plenty of space to travel. It was completely mangled and the locking mechanisms, if you can call them that, were sheared off from the tracks. So we started searching for a new cover. I was determined to be completely satisfied this time, after all this is a huge investment! I spoke with Alex on MANY occasions designing the enclosure and him promising to make me happy. I wanted openings on the ends that would allow my enclosure to travel past the diving board, handrail and ladder. Once we had everything hammered out then Alex had to review everything with my husband who is an engineer and even more meticulous than myself. My husband still thought it was a lot of money. It did end up costing about 20% more than our previous cover, but we had insurance money and we decided to make the purchase. The added cost was worth it, because of the quality and qualified installation. We ordered at the end of August 2014 and it was installed at the first of December 2014. The installment guys were simply amazing (and fun to be around)! They were from the Czech Republic and didn't speak much English but they install these things every day. They were meticulous in the installation process. Making sure everything was level and the tracks were square...this is priceless! It was installed within 5 days. 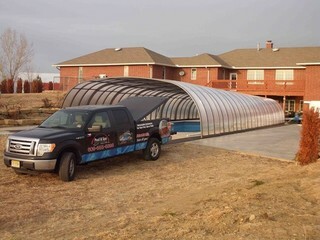 The enclosure we purchased was the Laguna Model 28'x56'. SIMPLY AMAZING! I absolutely LOVE it. Alex promised to make me happy and he definitely did. Even my husband, not so easily impressed, loves the enclosure! Mainly because it takes less than 10 minutes to detached the wire tie downs (we opted for this over kill due to KS gusting winds), unlock the segments and slide the whole thing out of the way. Even the end piece travels all the way back....due to the sliding door which clears the handrail and diving board and the cute little "doggie" door that clears my ladder. And it is definitely true, it can be moved by one person using one hand!!!! As apposed to taking a minimum of 3-4 hours to move our old AquaShild one and a minimum of 4 people. Needless to say it moved twice a year, uncovered for summer and covered for winter. My new Pool and Spa Enclosure can be moved in minutes and into various positions. For instance I can open the end to have friends gather and remain cool, while the kids have the remaining segments closed to block the wind and keep them warmer while in the water. Lets talk colors....there are many colors to chose from, we went with charcoal and love it, the color makes it look enriched, very classy. Lets talk quality....the quality is amazing. The tracks are comfortable to walk on and are of high quality to keep the enclosure in place. I compare my two covers as the AquaShield one being a card table and the Pool & Spa Enclosure one being a handmade oak dining room set, they both serve the same purpose but the difference in quality is what sets them apart. It had always been a dream of mine to have an in ground pool with an enclosure, so it was years of saving money to make my dream a reality. Thank you Alex for making me happy!."